NASA Scientists Finally Know What Time It Is on Saturn, Here's How? NASA Scientists Finally Know What Time It Is on Saturn, Here’s How? A view from NASA’s Cassini spacecraft shows Saturn’s northern hemisphere in 2016 as that part of the planet nears its northern hemisphere summer solstice. A year on Saturn is 29 Earth years; days only last 10:33:38, according to a new analysis of Cassini data. Researchers ay Nasa finally know what time it is on Saturn. This is a longstanding mystery of solar system science and it is clear that the length of the day is 10 hours, 33 minutes and 38 seconds. The space agency has taken so much time because the gas giant has no solid surface with landmarks to track as it rotates, and it has an unusual magnetic field that hides the planet’s rotation rate. The answer of the mystery was hidden in the rings of the planet and it has been found out by the Christopher Mankovich, a graduate student in astronomy and astrophysics at UC Santa Cruz, used the data to study wave patterns within the rings. He also studied the icy, rocky rings in unprecedented detail of the planet. According to his work, he determined that the rings respond to vibrations within the planet itself, acting similarly to the seismometers used to measure movement caused by earthquakes. The interior of Saturn vibrates at frequencies that cause variations in its gravitational field. The rings, in turn, detect those movements in the field. The research of the scientist was published on 17th January by Astrophysical Journal and describes how efficiently he developed models of Saturn’s internal structure that would match the rings’ waves. That allowed him to track the movements of the interior of the planet — and thus, its rotation. The rotation rate of 10:33:38 that the analysis yielded is several minutes faster than previous estimates in 1981, which were based on radio signals from NASA’s Voyager spacecraft. The analysis data by the NASA Voyager was totally dependent on the magnetic field information. NASA scientists usually rely on magnetic filed to measure planets’ rotation rates. Jupiter’s magnetic axis, like Earth’s, is not aligned with its rotational axis. So it swings around as the planet rotates, enabling scientists to measure a periodic signal in radio waves to get the rotation rate, however, Saturn magnetic field is totally aligned with its rotational axis and hence rings are the key to homing in on the length of day. Saturn scientists are elated to have the best answer yet to such a central question about the planet. 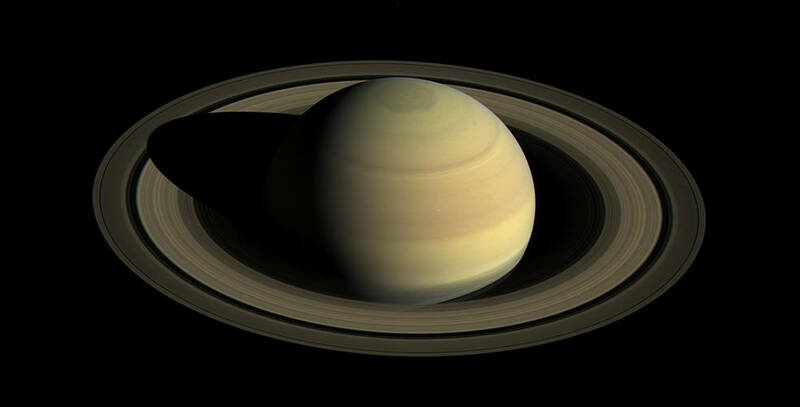 The idea that Saturn’s rings could be used to study the seismology of the planet was first suggested in 1982, long before the necessary observations were possible. Co-author Mark Marley, now at NASA’s Ames Research Center in California’s Silicon Valley, subsequently fleshed out the idea for his PhD thesis in 1990. Along with showing how the calculations could be done, he predicted where signatures in Saturn’s rings would be. He also noted that the Cassini mission, then in the planning stages, would be able to make the observations needed to test the idea. Cassini’s mission ended in September 2017 when, low on fuel, the spacecraft was deliberately plunged into Saturn’s atmosphere by the mission team, which wanted to avoid crashing the craft onto the planet’s moons. Featured Image Source: NASA/JPL-Caltech/Space Science Institute. Antarctica ice loss increases six-fold since 1979, Climate Change?